Mumbai, March 2017: The entire team of Hotel Sahara Star and its guests came together to celebrate the Earth Hour on 25th March 2016 between 8:30pm to 9:30pm. Addressing the mitigating climatic change and spreading the awareness of protecting the environment, the hotel participated in the Earth Hour, a global World Wildlife Fund for Nature (WWF) initiative. The hotel turned off the lights in most of the back-of-the-house areas and dimmed the lights in public areas and restaurants including neon signage. Resident guests too participated by turning off the lights in the guest rooms. Even the restaurants had dim lighting. The guests present at the restaurants enjoyed candle light dinner during this hour. There are several cities and villages that are deprived of electricity and as responsible citizens it is our duty to conserve energy so that these cities and villages can be lit up. Hotel Sahara Star estimated that turning off the light for an hour can save up to 1000 units of electricity which is equivalent to providing lighting energy requirement for 100 city residents for 24 hours. The team members of the hotel spread the word by educating the guests about the cause and informed them to switch off the lights and air conditions of their room before stepping in to the restaurants. The restaurants offered organic menu to the guests along with green cocktails. 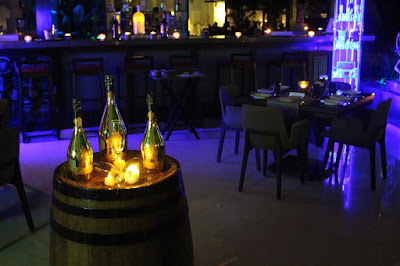 Guests enjoyed the different experience of enjoying a dim lit ambience with a guitarist playing soulful music. The Earth Hour participation is a small part of Sahar Star’s efforts towards building a happy and safe environment. In addition to this, Sahara Star has identified and implemented ways to reduce wastage, eliminate practices that are hazardous to environment. The Hotel follows best practices like energy-saving light bulbs and biodegradable cleansing materials, water restrictors and sewage treatment facilities for preventing water pollution. It is important that younger generation takes such initiatives and spreads awareness in the society.